NXP Semiconductors has announced its engagement in automotive Ethernet as the first automotive semiconductor supplier to license Broadcom’s BroadR-Reach Ethernet technology for in-vehicle networking. This is a significant step forward in establishing BroadR-Reach as an open, de facto standard for in-vehicle Ethernet. At the same time, Broadcom, NXP, Freescale, and Harman announced the foundation of the OPEN Alliance Special Interest Group. The objective of the newly founded group is to drive the wide adoption of Ethernet in the automotive industry. 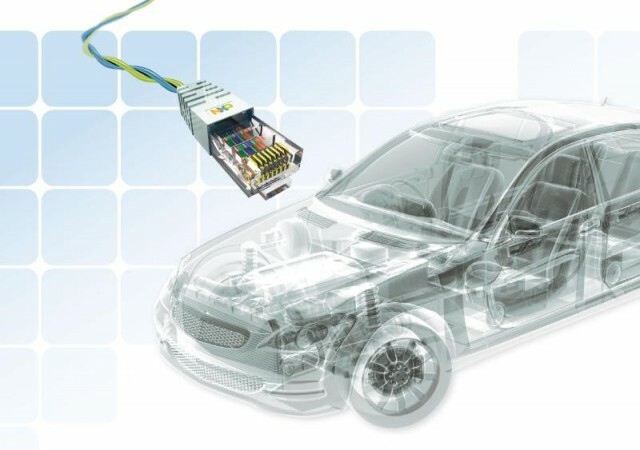 NXP plans to create an automotive-grade product portfolio for the Ethernet physical layer based on BroadR-Reach, leveraging NXP’s expertise in automotive electronics, in the industry’s quality requirements, as well as its strong application know-how. Major car manufacturers are designing with Ethernet as a high-bandwidth, low-cost networking technology complementary to existing in-vehicle network technologies such as CAN, LIN, LVDS and FlexRay. As automobiles evolve into ever more sophisticated and connected electronic environments, there is increasing demand among OEMs and design engineers for an in-vehicle networking technology that can handle high-bandwidth applications without being excessively expensive. Broadcom BroadR-Reach Ethernet technology has significant cost advantages over other high-bandwidth automotive networking technologies such as LVDS, based on its ability to operate over single unshielded twisted pair (UTP) cabling. Not only is single UTP less expensive and lower in weight than shielded cabling, the technology is already in use by CAN- and LIN-based control systems, enabling BroadR-Reach to run over existing in-vehicle networks. One of the key applications driving high-bandwidths in vehicles is camera-based security, a safety feature that may become mandatory for new vehicles in countries such as the US in the future. Currently, there are many instances when the driver doesn’t have a complete view in maneuvering the car ? for example, when backing out of a tight space or reversing down a drive. This may lead to damage to the car or injury to pedestrians. By networking a series of cameras mounted on the outside of the vehicle, the driver can get a 360-degree view of what’s happening around the car displayed via the dashboard. Other high-bandwidth applications that Ethernet could support include networked infotainment. Another advantage of using Ethernet as an in-vehicle technology is that it is a globally recognized standard that supports IP-based networking. This makes it much easier to adapt existing IP software and applications from the consumer and business markets for automotive use, speeding the development of the connected vehicles of the future, says the company.